I loved creepy books growing up. I still love them! That tingly tingle you get at the back of your neck when you've got your hands on a truly spooky read is exhilarating! 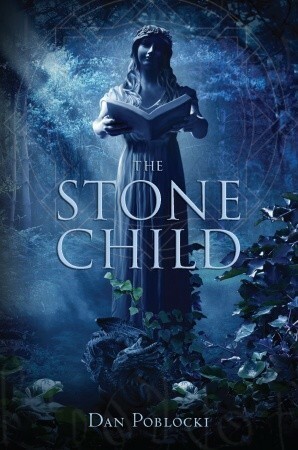 Please enjoy the review and, if you love a good spine-tingling tale, go check out "The Stone Child" for yourself! What if the monsters from your favorite horror books were real? Eddie Fennicks has always been a loner, content to lose himself in a mystery novel by his favorite author, Nathaniel Olmstead. That’s why moving to the small town of Gatesweed becomes a dream come true when Eddie discovers that Olmstead lived there before mysteriously disappearing thirteen years ago. Even better, Eddie finds a handwritten, never-before-seen Nathaniel Olmstead book printed in code and befriends Harris, who’s as much an Olmsteady as he is. But then the frightening creatures of Olmstead’s books begin to show up in real life, and Eddie’s dream turns into a nightmare. Eddie, Harris, and their new friend, Maggie, must break Olmstead’s code, banish all gremlins and monster lake-dogs from the town of Gatesweed, and solve the mystery of the missing author, all before Eddie’s mom finished writing her own tale of terror and brings to life the scariest creature of all. Truly, I was so impressed with this work. Poblocki is, in my opinion, a master horror writer for young adults. He tells a fantastic story full of adventure, life lessons, and REALLY FRIGHTENING moments that even kept ME up wondering what was creeping around in the shadows. Okay okay... so I have an overactive imagination in general but regardless... he writes really creepy books! Eddie, Harris, and Maggie are three REALLY BRAVE kids but they kind of have to be. It's either that or let the world be overrun by evil creatures from the dimension of darkness... and we're talking REALLY awful things. Forget all of the newfangled horror shows that you're familiar with... this is plain, good old-fashioned bump-in-the-night stuff that makes you keep your nightlight on. Aside from all of the creepy stuff, we're looking at a book with a message here. Poblocki's books consider the bravery and multi-layers of the characters' young psyches. The dark side of human nature and the potential for darkness in all human beings are considered. The fight for what's right and good for everyone against all odds. Considering others before considering yourself. This book reminds me of the saying "Bravery is not the absence of fear but the triumph over it." Young and old readers alike will enjoy this spine-tingling yet feel-good story about overcoming all of life's obstacles even when they seem too insurmountable to consider. Technically speaking... Poblocki's writing style is engaging and forward moving. You're in the hands of a master story teller with this author and he makes it feel as though his tales are actually millennia old legends passed down through the generations of tale spinners. The mystery aspect of this book is plenty suspenseful enough and there are moments when you actually figure out what's going on before the characters do and you're on the edge of your seat trying to warn them by talking through the pages. "No! Don't open that door! OMG YOU DID!" Very talented author. Very great book. I recommend this book for Adults and young readers who enjoy frightening stories, but probably not for young readers who are very easily spooked or who might be kept up all night. If your readers aren't likely to read a "SCARY STORIES" compilation then this book isn't for them. This isn't "Goosebumps fright" here, folks. You know, spooky with a twist of quirky. Poblobki's books are straight up creepy.